Welcome to Vollrath University. I'm Chef Rich and we're here today to talk to you today about the Vollrath in-chamber vacuum pack machines. First, let's talk about why we call them in-chamber machines. In-chamber machines mean that we take the product, we place it in a vacuum bag, we place the entire bag inside the chamber, and close the cover. Everything is under a vacuum. This is different from the out-of-chamber machines, such as the food savers where the product lays outside and the machine clamps down on the edge. So, that's why we call these in-chamber machines. 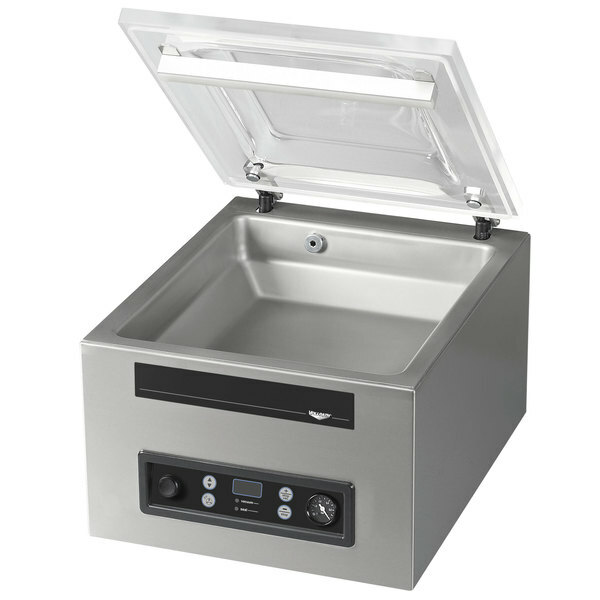 The Vollrath in-chamber machines are great products for extending the life of foods, both fresh and frozen. They do an excellent job of securely storing product as well, so nothing spills in or spills out of the bags. They do a great job of marinating and they are also used in sous vide cooking. If you want to cook sous vide, you're going to want to vacuum pack your product in the bag. Now, both of these units feature the premium Busch pump. This is a German-made pump that's very high quality. In the world of vacuum packing, the pump is everything and this pump is rated as the best. They both offer digital controls. They have a dual seal bar. Each unit has a dual seal bar. What I mean by that is that each bar has two independent seal wires, so on each bag that is packed you will get two independent seals for extra security on the seal. They also have two pistons. Now, the pistons underneath the seal bar press up evenly and securely so that each seal is a premium, high quality seal. Both of these units offer a two year warranty and they are ETL rated for safety and sanitation. Okay, so let's start by talking about the VP12. We call it the VP12 because it has a 12 inch seal bar. What that means is that the opening of the bag or the bag size can be up to 12 inches. We can use multiple bags, say a six inch bag, as long as we make sure we don't overlap the edges. Okay, so the 12 inch unit is a time-only unit, meaning we set the time that we want the pump to run, or the cycle to run. We can interrupt that time by pressing the "vac stop" button on the front if we see on the gauge that it's at the pressure that we want, so that's a nice feature to have. We can also adjust on the VP12 the seal time. Now, the bags come in different thicknesses. This is a boiling bag, so it's a little bit thicker versus, say, a normal storage bag. Well, you want to run the seal time a little longer on thicker bags and maybe not as much on the thinner bags. So, adjusting the seal time is also a very nice feature to have. Lastly, on the VP12, we'll talk about the pump conditioning program. 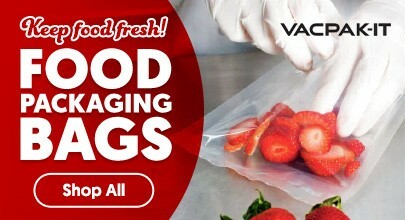 Now, when we are vacuum packing liquids, vapor can come off of the liquid. That vapor will then get into the pump and it will actually damage the pump over time. So, if you're vacuum packing a lot of liquids in a day, we recommend that you run the pump conditioning cycle daily. If not, we recommend at least once per week. Okay, so that's the VP12. Now, let's talk about the VP16. Just like the VP12, we call the VP16 a 16 because it's a 16 inch seal bar. Just like the 12, we can use the smaller bags as long as we don't overlap them along the seal bar. But now, this unit actually has 2 seal bars. We have one in the front and one in the back.So, we lay the product along the seal bar. If we put product in the front and in the back and they overlap at the center, that's fine. We just cannot overlap anything along the seal bars. Now, the VP16 we can operate as a timed unit just like the VP12. We can interrupt that cycle just like the VP12 by the hitting the "stop vac" button. But, we can also operate this unit to the percent of pressure or percent of vacuum. The percent of vacuum is really nice when we are dealing with items that are more delicate, like fish, and we would only want an 80 percent vacuum. So, we set it to that 80 percent. When the unit reaches that 80 percent vacuum, it automatically goes into the seal mode. So, a nice feature to have. We also have liquid control on this unit. What that does, is as we are vacuum packing liquids either in soups and sauces or a product with a marinade in it, as soon as the unit senses some of the vapor coming off the liquid, it automatically goes into seal mode. So, again, a nice feature to have to not only preserve the quality of your food because we're not taking any excess liquid off the food, but also help preserving our pump. Vacuum plus. This feature on this unit is a very nice feature to have, especially when we are dealing with large quantities of product. So, as we put larger quantities of product in the bag, we can use the vacuum plus feature to sure that we get all of the air out of the bag. So, the way the feature works is we'll set it to 99 percent vacuum and then we can set a delay. The delay is nice because the unit will maintain that percent vacuum and then seal when the delay is over. Soft air. This is a nice feature for delicate items like, again, fish, or something very light. What soft air does is it controls the amount of air that we let back into the machine after the seal cycle has ended. If we let the air in too quickly, what can happen is the bag can collapse onto the product and if there's something sharp, say a bone in a steak, it can pierce the bag. Again, if it's a very light product, the product can be tossed about. So, soft air is a nice feature to have for those two types of product. In addition on the VP16, we have 10 presets that we can now set all the features that we just talked about based on the food type. Also, don't forget about the pump conditioning program. We offer that again, just like on the VP12 when liquids are involved to dry out the pump and prolong its life. Also, on the two units that we have talked about here today, we include a maintenance kit that includes extra oil and supplies for maintaining your seal bars. For more information on either of these two models, please see us online at Vollrath.com. 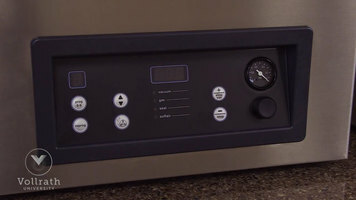 Vacuum pack your fresh or frozen foods with these innovative Vollrath in-chamber machines! With dual seal bars and various special features, you can ensure air-tight seals and a long product life. This Vollrath 40831 medium vacuum packaging machine gives your dining operation high-quality packing in a small and compact tabletop design. Two sealing cylinders provide optimal pressure to create the best seal possible, ensuring that the contents inside your bags won't leak, drip, or be exposed to exterior contaminants; additionally, the busch rotary vacuum pump and 12" sealing bar work together to make the entire process fast and effortless. A stainless steel exterior with deep drawn chamber gives extra durability to the unit, and the sealing bar can be removed without tools for cleaning and maintenance. The front control panel enables users to enter a definable vacuum setting (up to 99 seconds) and seal time (up to 6 seconds). The packing cycle begins when the transparent lid is closed and will end immediately upon opening. Other features include a slow chamber depression that allows the bag to gently form to the product, integrated maintenance reminder, and a pump conditioning program to remove excess moisture and debris. This machine accommodates bags up to 12" wide and includes two insert plates for packing small products. A full maintenance kit is included.